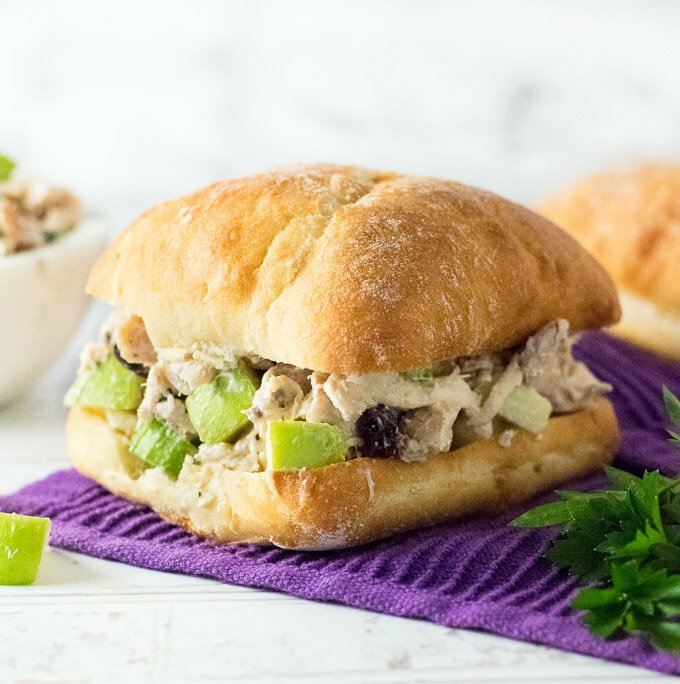 Chicken Salad with Apples is a refreshing twist on the classic. The bright clean flavor of Granny Smith apples stands out among tender shreds of chicken, and a creamy seasoned sauce. There are things in life we need more of: kindness, generosity, and salads that don’t include lettuce. So I guess making a chicken salad and giving it away to a friend is the type of thing Nobel Peace Prizes are made of. 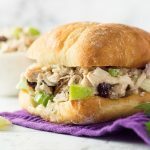 Really, I can’t get enough of chicken salads, they are quick and easy to prepare, pack a ton of flavor and can be enjoyed a variety of different ways. The easiest way to make chicken salad is to use rotisserie chicken. It is already pre-cooked and exceptionally tender, so there isn’t much you need to do other than shred it. You can even buy it in advance and cool it in the refrigerator a day or two prior to making the salad. I find it is best to mix all of the ingredients without the chicken first. The reason for doing this is because as the chicken is mixed it tends to break apart into increasingly smaller shreds. The smaller the shreds, the less creamy the chicken salad will be because there will be more surface area of chicken the sauce needs to cover. If you find your chicken salad with Apples needs to be creamier for any reason, there is no harm in adding more mayo. Apples are not the only great addition to chicken salad. Nuts play nicely in the salad as well. Specifically, I like my chicken salad with apples and walnuts, though pecans would be a great substitution as well. The nutty crunch nicely contrasts the tender chicken. 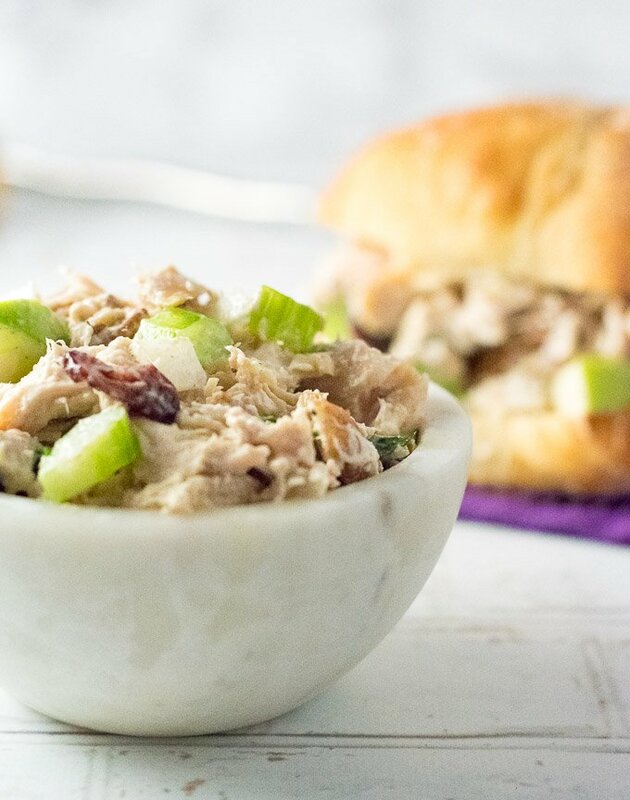 Chicken salad can be served in a bowl and simply enjoyed with a fork, or you can enjoy it as a hearty sandwich. I always recommend toasting your bread when serving chicken salad, it adds better texture and it helps stand up to the creaminess of the salad. 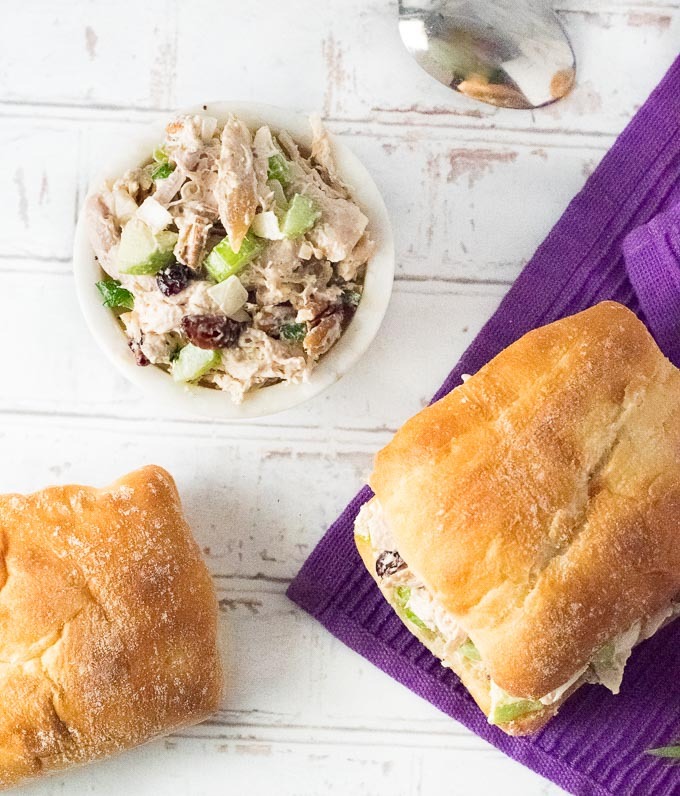 Croissants and ciabatta bread are two of my favorite options for chicken salad sandwiches. The possibilities for making chicken salad are endless. Be sure to check out my Classic Chicken Salad, it is a great base to make your own recipe too. Otherwise, Chicken Salad with Grapes is a popular variation as well! Mix all ingredients in a large bowl until combined, with the exception of the chicken. Add shredded chicken to the bowl and mix to incorporate. Chicken salad can be served immediately or set in the fridge overnight to allow flavors to meld. Serve in bowls or on bread to enjoy as a sandwich. IF YOU LIKED THIS RECIPE you will love my Taco Salad with Doritos! If you enjoyed my Chicken Salad with Apples recipe then you should probably like me on Facebook and follow me on Pinterest too. That’s what I would do at least, because if you don’t get to know me but you still use my recipe it is kind of like taking candy from a stranger, and your mom taught you not to do that. Don’t disobey your mom, subscribe to Fox Valley Foodie today! I made this today-yum! Love your blog and recipes. This is now my go-to chicken salad recipe!